Play Super Cash Buster slots and win instant wins on multiple bonus rounds! Roll the dice and reveal the colours of the blocks that will be destroyed! 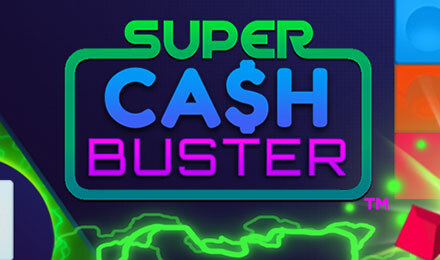 Super Cash Buster is an instant win game that enables you to blast your way through wins! On the screen, you will find the Cash Buster Zone which is where all the vibrant blocks are located. When the dice is rolled and it reveals a colour, corresponding coloured blocks in the Zone are destroyed. On some of the blocks you will find instant rewards that are triggered when they are destroyed. Each of the blocks that are destroyed automatically fill up the slots on the left of the screen. When the slots are full your cash wins are rewarded.